Designer, Consultant, Contractor, Panel buider, Facility manager, Student, teacher, Standardisation or certification person,… you all are forced to respect IEC standards daily for the security of your installations. Yet, the writings about the current regulations are complex and constantly evolving. You often encounter difficulties to put these standards into practice; you lose a lot of time – so then money, deciphering writings from the regulations. Naturally, and you know it, these approaches and situations are not viable. Fortunately, there is a reference work written by reputed experts that has been edited by Schneider Electric since several dozen years. 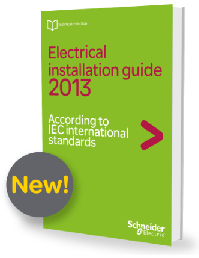 This guide is without equivalent and provides a clear and practical explanation of the different steps to design an electrical installation according to the IEC 60364 standards, and other relevant standards of the IEC. We offer you the new 2013 version of the guide, which contains more than 600 pages and that usually costs 40€ (paper version). We propose you to DOWNLOAD it right NOW and FOR FREE; all you need to do is to click on the button below. or copy this trackback: http://engineering.electrical-equipment.org/engineering-web-tips/electrical-installation-guide-new-version-free-download-now.html/trackback from your own site.